Tired from our long journey from Brigantine, we got a somewhat late start on Sunday. We figured to spend a couple of hours birding in Morris County, and Ivan had a few ideas for stops within Boonton Township, but for the most part, we were playing it by ear. First we stopped at the Tourne County Park. Or rather, we made two stops at the Tourne ... one at the level field area near a Christmas tree farm, and the other in the hillier area of the park. Both stops were largely unproductive, as the birds apparently thought wiser of going out in the chilling cold than we did. I don't know where they could have hidden, but I conjured a mental picture of a bunch of them hanging out in some kind of finch coffeehouse, sipping at warm drinks and reading the Sunday Times. We also tried the field near Kincaid Woods, which, ironically, we'd passed up as too hot to hike around during our July visit to the Spoon House. This time around, the presence of frolicking dogs and their people made the spot unbirdable. It's not that we don't like dogs -- we do -- but no self-preserving bird does. Given the cold, we weren't about to wait for the pups to get tired and head back to their people. Our next option was Johanson Memorial Field. You might recall our last visit there, a jaunt that revealed an important yet obscure portion of aviation history. It's not on the typical New Jersey birding circuit, but the variety of habitat seems amenable to a wide range of avian life. And let's face it, what bird could resist landing at the site of a historic airstrip? I pulled onto the park drive from Powerville Road, and just as we reached a clearing, Ivan tensely told me to slow down. By now, I know what that means: important bird in sight, do nothing to spook it. On the other end of the clearing, atop a cedar tree, was a light-colored bird. I couldn't make out any detail since my binoculars were in the back seat. Ivan, on the other hand, wears his bins like a natural appendage and quickly announced that this could just be a shrike. Which kind, he wasn't yet sure, but a shrike, not a mockingbird. 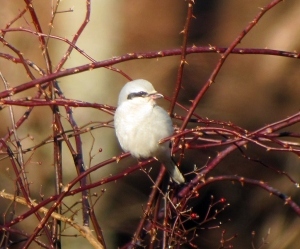 For the uninitiated, a shrike is a predatory songbird that breeds in the Canadian tundra and winters in the northern US and southern Canada. New Jersey is pretty much the farthest south it will go on the east coast, though there are rare sightings as far down as the Carolinas. Here we're lucky to get a handful in a given winter, so if Ivan was seeing what he thought he was seeing, it was big news. The bird's perch-to-ground-to-perch behavior was characteristic of a shrike, and it appeared to have the appropriate markings. The question then became whether it was a loggerhead shrike or a northern shrike, and the width of the bird's dark eye mask would settle it. To settle that, we'd need a closer look, and unfortunately we hadn't brought the scope. Getting physically nearer could spook the bird, but we had to take the chance. I parked the car in the nearby gravel lot and Ivan headed out to check. The bird, however, wouldn't cooperate, and after a double-check look at a field guide, Ivan wasn't comfortable making a judgement call. Maybe it would be best to go to another park and come back in a bit, when the bird wouldn't be so wary. That's exactly what we did, roaming the area and discussing that a shrike needed to be reported to the appropriate birding authorities post haste. People would want to see it, and another set of better educated eyes than mine would be helpful in corroborating the find. When we returned to Johanson, I edged the car up toward the clearing again, both of us prepared to see the bird in question perched on the cedar. He didn't disappoint, and we weren't going anywhere. As Ivan scanned for telltale markings, I stopped the car and cut the engine to reduce the heat shimmer that was distorting his view. From the drivers' seat, my view was distorted by the windshield, so I slid open the moon roof and slowly lifted my head and binoculars through. Perfect. Not only did the bird stay atop the tree, he did a little pirouette, almost, to allow us a better view of his face and body markings. There was no doubt, especially after another peek at the field guide. This was a northern shrike, and it was our find. Well, it was Ivan's find... I was just along for the ride, but it was pretty darn cool. What was even better than finding it was having it corroborated by the other birders who also saw it after seeing our reports on Birding on the Net and MocosocoBirds . It's still around, too, perhaps even for the winter season. Maybe now more folks will check out Jimmy Doolittle's old field in Boonton for aircraft of a different sort.